Recipient of the Vaco Accounting Student Scholarship and Belmont University student Yihano Hong, left, receives a check from Jerry Bostelman of Vaco during the Nashville Business Journal's awards dinner recognizing the 2017 CFO Awards finalists. Yihao Hong, a senior accounting major, was recently named the recipient of the Vaco Accounting Student Scholarship Award. 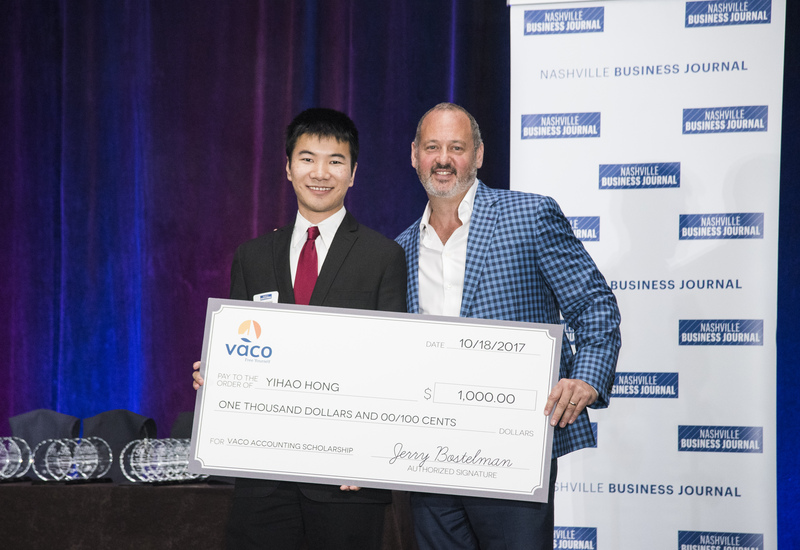 Vaco provided a $1,000 scholarship to a deserving undergraduate student in the region, and Hong was recognized on stage at the Nashville Business Journal’s Chief Financial Officer Awards on Oct. 18. He will also be included in the Oct. 27 issue of NBJ. Hong has already been accepted into the Belmont University’s Master of Accountancy program where he plans to pursue CPA eligibility.